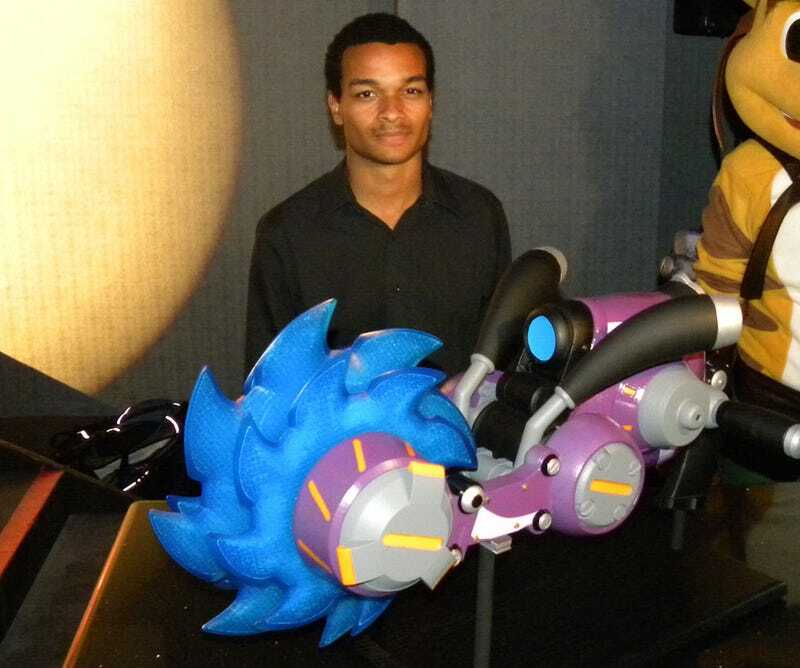 At a party in San Diego last night, Insomniac Games announced the winner of the "Captain Qwark's My Blaster Runs Hot" weapons contest, presenting the winner with a real-life version of his creation. Insomniac's swank Hard Rock Hotel soiree had plenty of free drinks and enough cupcakes for everyone, but I did manage to pull myself away from the red velvet/cream cheese frosting goodness long enough to snap a picture of the winner and his mighty fine prize. Behold the Spiral of Death, in the plastic flesh! The Spiral of Death, or SoD as we will eventually affectionately come to know it, shoots buzz saw blades out in a spiral sweeping maneuver, eventually returning to Ratchet like a yo-yo performing a very deadly version of around-the-world. The proud creator, whose name probably isn't cupcake, gets to bring that monstrosity home and display it on his monstrosity displaying shelf, eventually selling it on eBay to buy himself a house. Congratulations, not-cupcake!